31382 CHARLES FRODSHAM NUMBER 2167. A FINE AND SMALL MAHOGANY WALL REGULATOR BY THESE NOTED MAKERS. CIRCA 1905. A beautifully proportioned small mahogany wall regulator in a style much favoured by the Frodsham Company. The mahogany case with an arched top and with bevelled corners to both the top and to the trunk of the case. There is a strong moulding below the face and then a full length opening glazed door. The bottom of the case finishes with an under cut moulding in the Viennese style. The case is veneered with well chosen flame veneers and all the doors are tight dust proof fits. 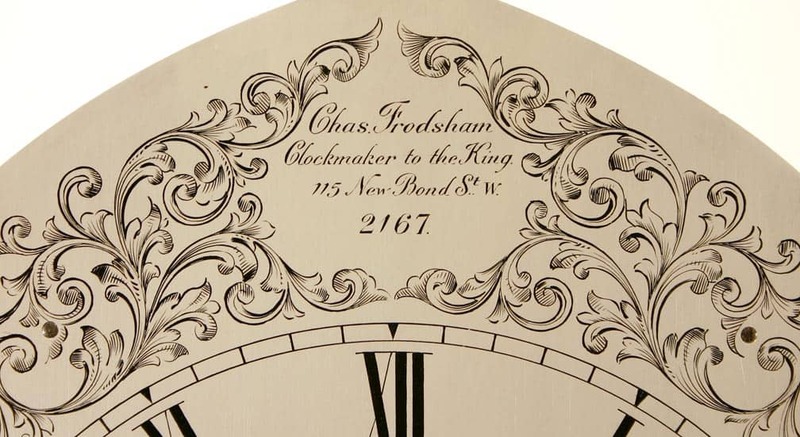 The very attractive 7.5″ silvered brass dial has engraving at the top of the dial with the signature ‘Charles Frodsham, Clockmaker to the King, 115 New Bond Street, 2167’ in a cartouche in the top of the arch. 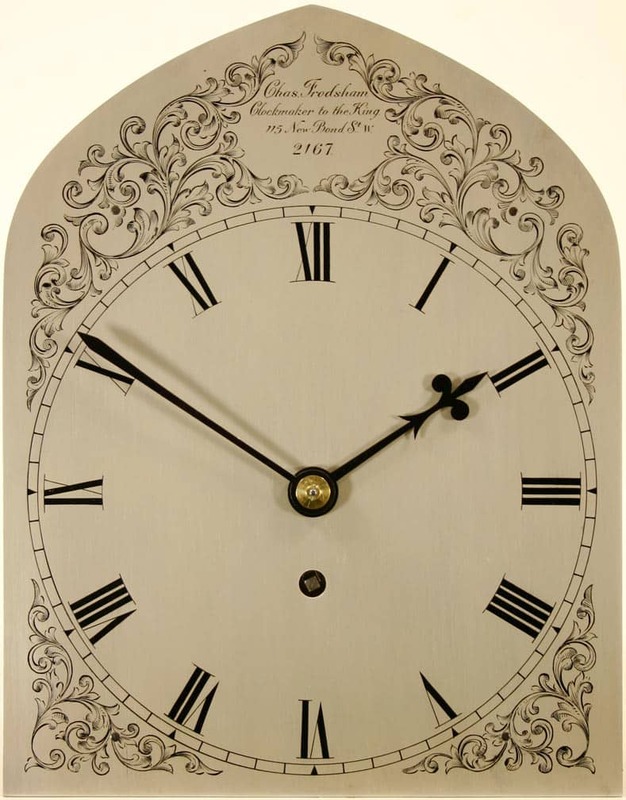 There is further engraving at the bottom of the dial to take the place of spandrels. 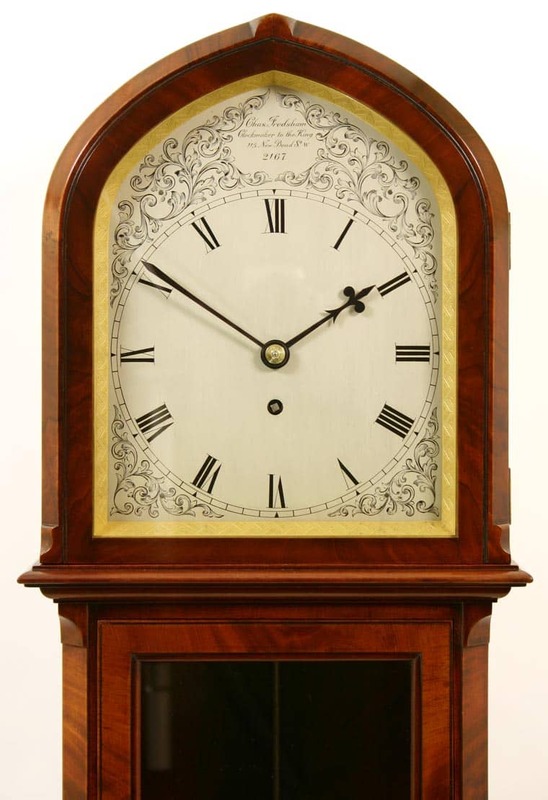 The dial has bold Roman numerals and well shaped and highly visible hands. The steel rod and steel jar mercury pendulum is a nice feature. It has a slim steel mercury jar with graduations to the top with a well shaped T-bar to enable the pendulum to be held straight while the jar itself is screwed up or down. It terminates in a shaped pointer which oscillates in front of the beat plaque. 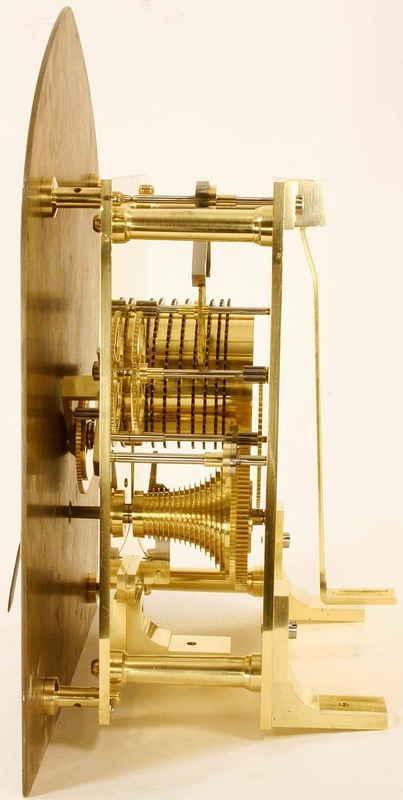 The fine quality eight day chain fusee movement has a plain back plate with full signature for the maker. The substantial plates are separated by shouldered pillars pinned at the front. 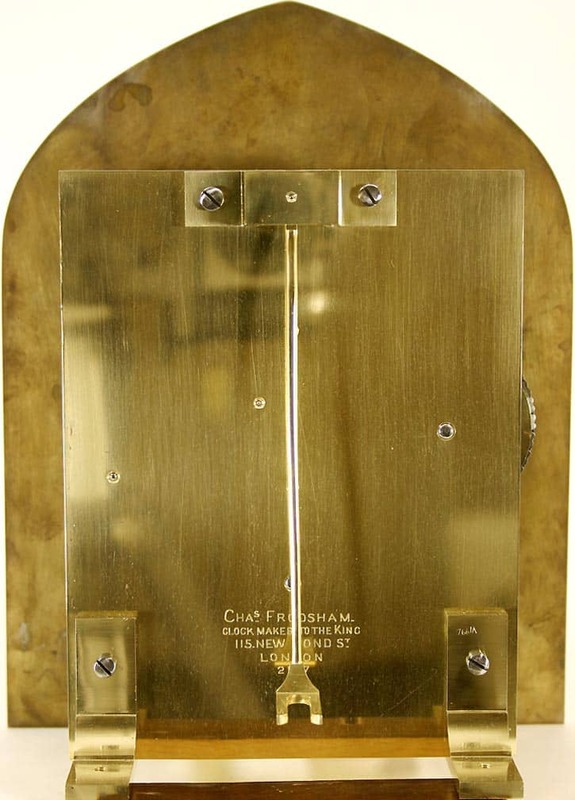 The movement employs Graham’s deadbeat escapement and has maintaining power.